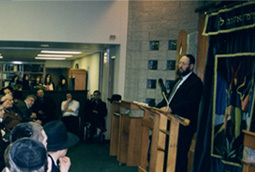 The Chicago Community Kollel Institute for Advanced Torah Studies, headed by Roshei Kollel, Rabbi Dovid Zucker and Rabbi Moshe Francis, is a nationally renowned institution of higher learning located in the West Rogers Park neighborhood of Chicago. Its campus is comprised of a beautiful main building and three residence buildings which house its members. The Kollel consists of a core group of scholars who are engaged in full-time study at an advanced level. When these full-time Kollel fellows graduate, they assume positions of leadership in the Jewish community. 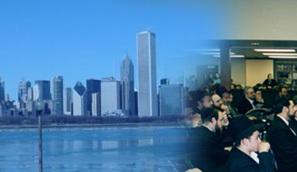 Kollel alumni occupy important teaching and administrative positions both in Chicago and across the United States. The Kollel conducts a multi-faceted program of adult education for the community on all levels. These classes are held primarily at our main facility. There are also satellite classes held in offices in downtown Chicago and the suburbs as well as in private homes. The Kollel can arrange private study partners for those who wish to further their Jewish knowledge. It also holds a monthly “Buffet of Jewish Thought” program at select downtown hotels featuring renowned speakers. Monday - Thursday 9 a.m.